Get ready. Get set. 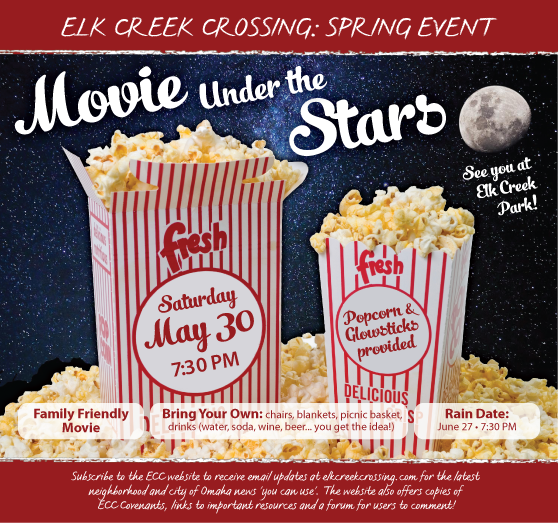 For Elk Creek Crossing’s first “Movie under the Stars” family night. Saturday, May 30, 2015 at 7:30 p.m. Bring along chairs, blankets, drinks (water, soda, wine, beer – what have you) for a great night watching family-friendly movies under the stars. Yummy popcorn will be served at no charge, of course. This will also be a fantastic time to get to know your neighbors, socialize and laugh, too. Sponsored by the ECC HOA. See you there!